Halloween just ended but we can't help but go ahead and get excited about Christmas! Especially, a little Christmas swag. Here are some of our favorites from last year. Stay tuned for a sneak peak for Christmas 2016 with C&G. If you need us, we will be making (a lot of) wreaths, spiking our eggnog with our favorite bourbon, and decorating my (Morgan's) house obscenely early! We are always struck by how different each couple we meet is. Their stories, style, and dreams for the future are all unique. 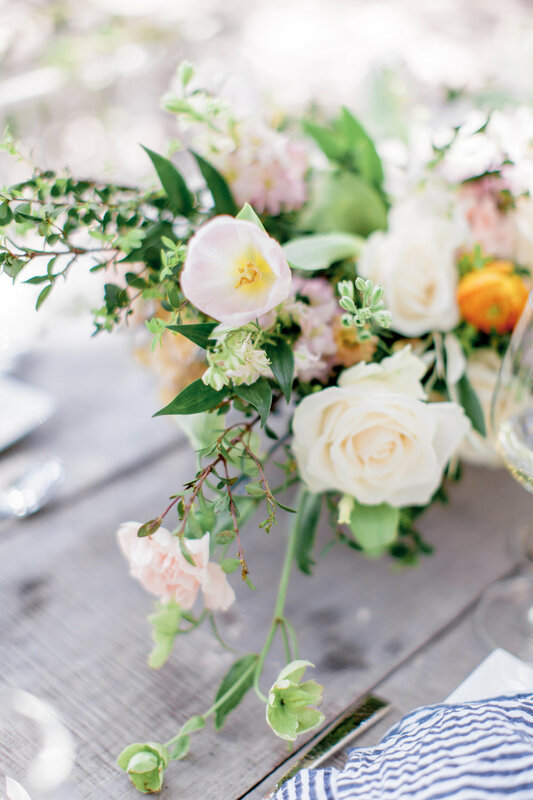 Part of what we like best is trying to find a way to create florals for an event in a way that reflects that story. Savannah & Trevor exude a beauty and depth that could make even a cynic believe in a love that never fails. We wanted to capture this simple, beautiful, but somehow wild and free kind of love. Savannah and Trevor, thank you for allowing us to be a part of your day. We wish you all the best! Workshops are the best. Mostly because we have the best students (and friends and customers)! Because we love a good cocktail more than your average lady, we were thrilled to kick off The Lovely Gathering Series with a lesson on how to stock the bar and mix the perfect cocktail! Make your invitation clear so guests know what to expect. Will it be casual (like Creektails - Carlyn's low-key cocktail party hosted spontaneously throughout the year) or a more standard cocktail party (more dressy casual...think Audrey Hepburn). Consider hiring a bartender so you can mix and mingle instead of mixing drinks all night. Have at least some food (including a carb and something for any guests with dietary restrictions). You don't want guests getting too tipsy! Be prepared to call (and even pay for) your guests' uber, if they didn't utilize that service in the first place. Never send your friend out the door tipsy with keys. (I know...duh! But, it happens a lot). Regardless of what you're mixing, your bar for a cocktail party should have these basics: whiskey/bourbon, vodka, red wine, white wine, beer. You also want one non-alcoholic offering! We recommend Buffalo Trace Whiskey and Deep Eddy Vodka for the most bang for your buck. If you really want to jazz it up, go for Woodford Reserve and Grey Goose. You should plan to have 1 bottle of wine per hour for every 2 guests AND be prepared to have twice the amount of glasses as you do guests. Speaking of glasses....be sure you are holding yours in your left hand by the stem, so that you can shake hands with your guests AND so you don't warm the drink or get condensation all over you. Here is a great link to give you a recap of which glass is which AND what should go in each glass. For a nicely balanced cocktail, there are 4 main elements that can be included. When you know this formula, you can create countless delicious concoctions! Then you can add a couple of dashes of bitters, a few sprigs of herbs, etc. for your bitter component. Taste test your cocktail and if you think it's too strong, you can always add water or soda, but remember if using ice, the ice will melt quickly and naturally water it down and nobody likes a watery tail! Put lime juice, bourbon, mint, ice in shaker. Shake it up. Pour over ice and top with ginger beer. If making a big batch for a party, don't worry about shaking. Just pour all ingredients into a dispenser and add lots of mint and lime slices in the dispenser. few dashes of Angostura bitters. It is stirred in a bar glass (never shake a Manhattan unless it is specifically requested, this cocktail should be cold and clear) and strained into a chilled cocktail glass and garnished with a cherry. Remember that the cherry garnish is THE BEST! Feel free to think out of the maraschino box and try something like this. Drew & Brandy have to be one of the best couples we have ever met. They are fun and completely beautiful (inside and out). LOVE, LOVE, LOVE them! They were married in May but offered to be our models in a photo shoot over the summer. Coordinated by one of the best, Marie King, and captured by the heartwarming Allie Pedigo. This kind of felt like the dream team of photo shoots. 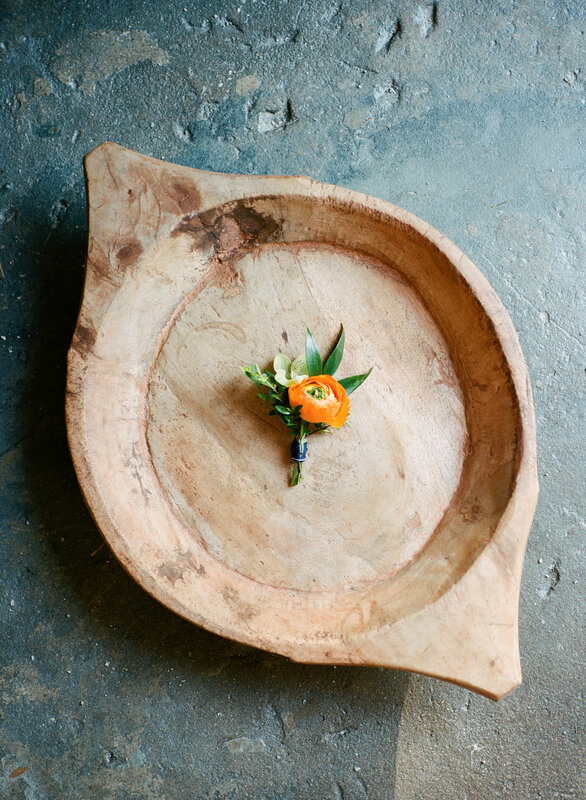 We were over the moon when we found out this project would be featured with Southern Weddings. 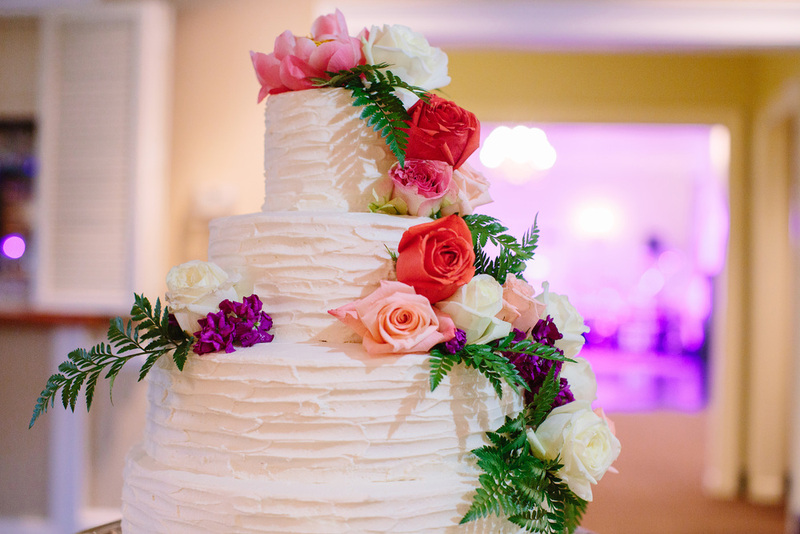 Here is a sneak peak of our feature on the Southern Weddings Blog, but see the full story here! 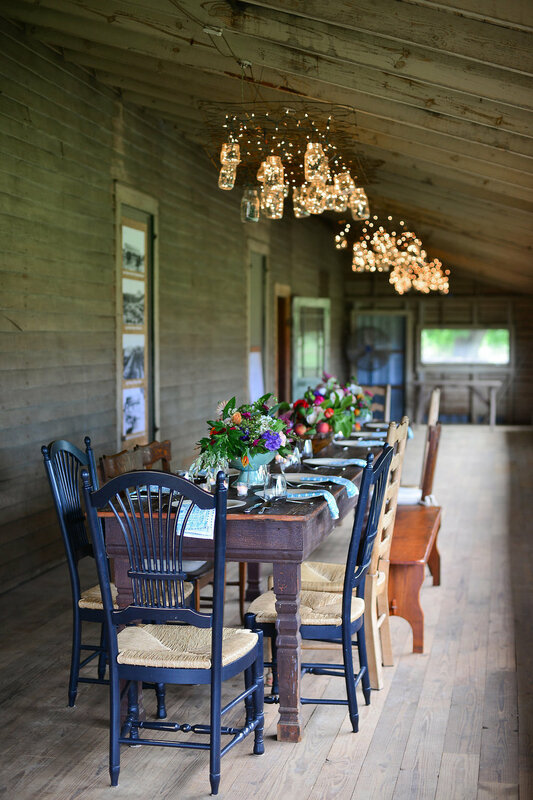 Last weekend, we had a fabulous time partnering up with family and friends at Pearson Farm for a delightfully southern farm-to-table dinner party, or more properly termed in the south, a peach supper. For those of you in Atlanta, you've probably seen Pearson Farm peaches at the grocery store, one of the many farmer's markets, or gracing seasonal menus at top local restaurants. Simply put, their peaches are the best. Biased? Maybe. Carlyn's sister and brother-in-law are Lawton & Lanier Pearson...the farmer and the farmer's wife. 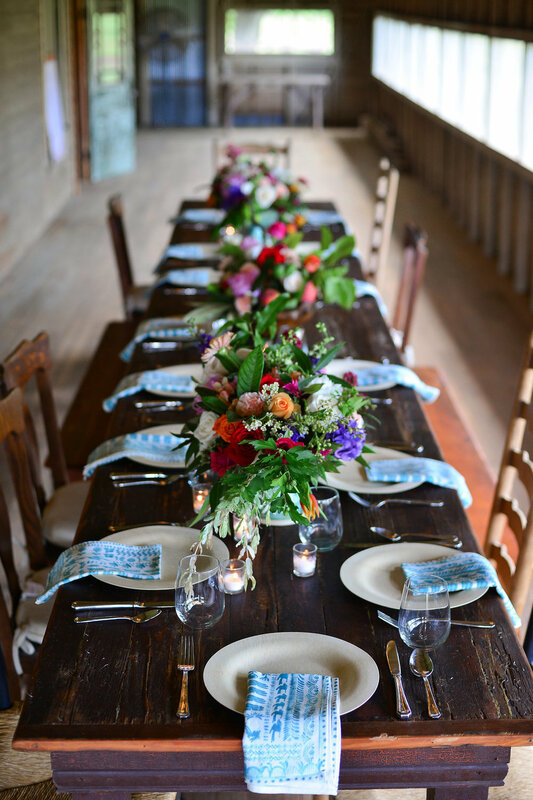 On a girl's trip in Atlanta, Carlyn and Lanier decided it was time for Camille & Gray and Pearson Farm to get together and throw a peach party! If there is one thing Camille & Gray loves...it's a party. The setting is simply indescribable. 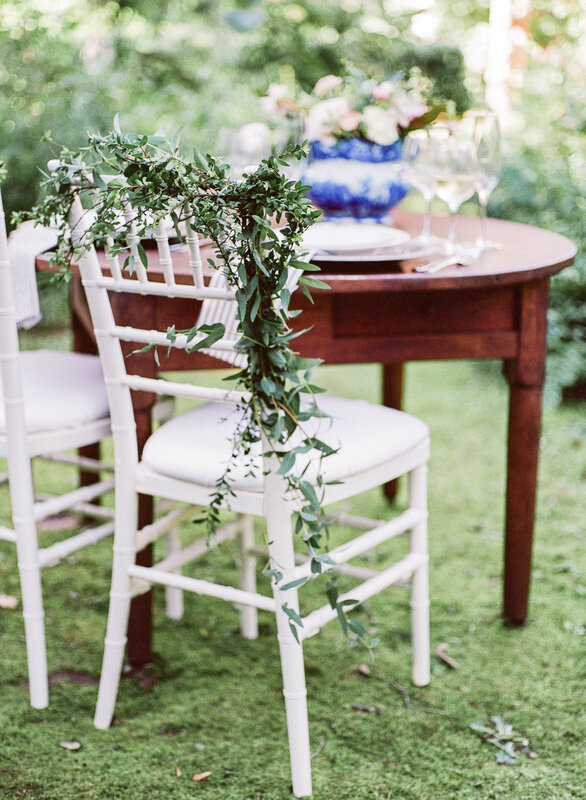 We set up hors d'oeuvres and drinks on the grounds of the Lee Pope house, a beautiful, renovated southern farmhouse surrounded by rows upon rows of peach trees. For the actual meal, we walked next door to a rustic, old farmhouse with a screened-in porch overlooking the farm, with a very legit farm table. We made 3 lovely arrangements incorporating all of our favorite flowers, fresh peaches, apples, and figs. We had so much fun down at the farm with family and friends. Thanks to the Pearson family for hosting us and to Carlyn & Lanier's mom, Carla, for contributing her culinary skills, as well as designing the best antipasto tray this side of the Mason Dixon line. Next time you throw a party, keep Camille & Gray in mind. We know how to kick things up a notch! This Valentine's Day we are doing a special flower sale. What better way to say I love you than to share something beautiful with the one you love. 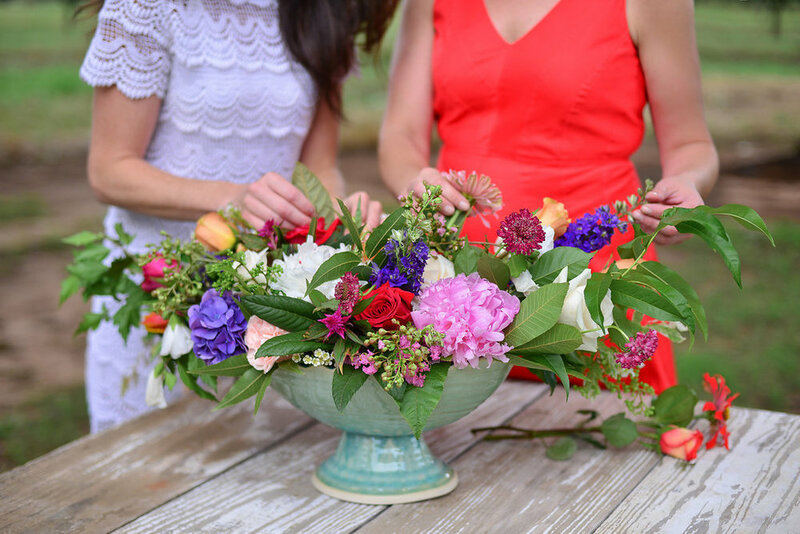 Our arrangements come in our favorite containers from Anthropologie and similar stores and are filled with a combination of beautiful flowers. Think peonies, italian ranuculus, dahlias, roses, etc. Best of all, 20% of the profits go to the Leukemia and Lymphoma Society. Pre-sale runs from 1/8/16 through 1/13/16. Arrangements may be picked up on Saturday, February 13th between 3pm and 6pm in Buckhead OR delivered on Saturday or Sunday afternoon, February 14th for $15. You will receive more details regarding pick-up when you place your order. P.S.- Morgan is running a marathon in Puerto Rico for the Leukemia and Lymphoma Society. If you would like to make an extra donation, visit her fundraising page. 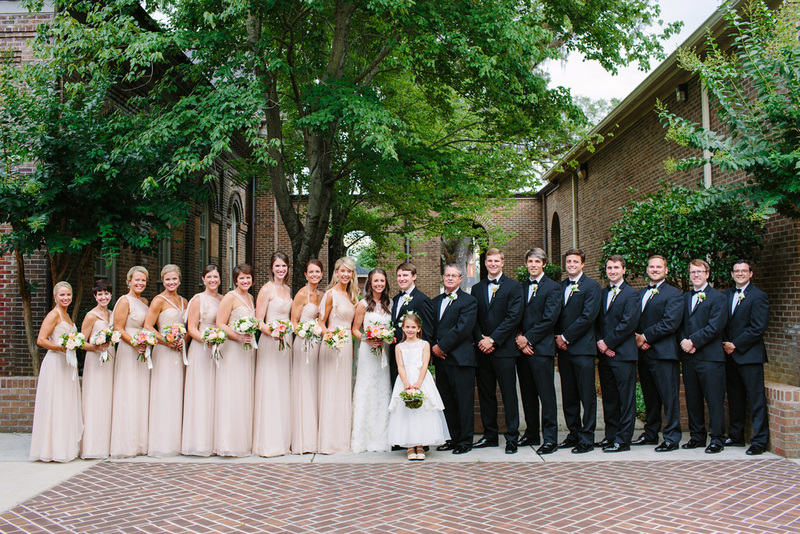 In June, we got to celebrate an extra special occasion in beautiful, historic Thomasville, GA. Our very own sweet Carlyn married Jay Clawson on a lovely summer day. In addition to being a beautiful and fun (can you say dance party?) wedding, it was an honor to celebrate such an incredible, loving couple. Best Wishes, Carlyn and congratulations, Jay. Much love to you! 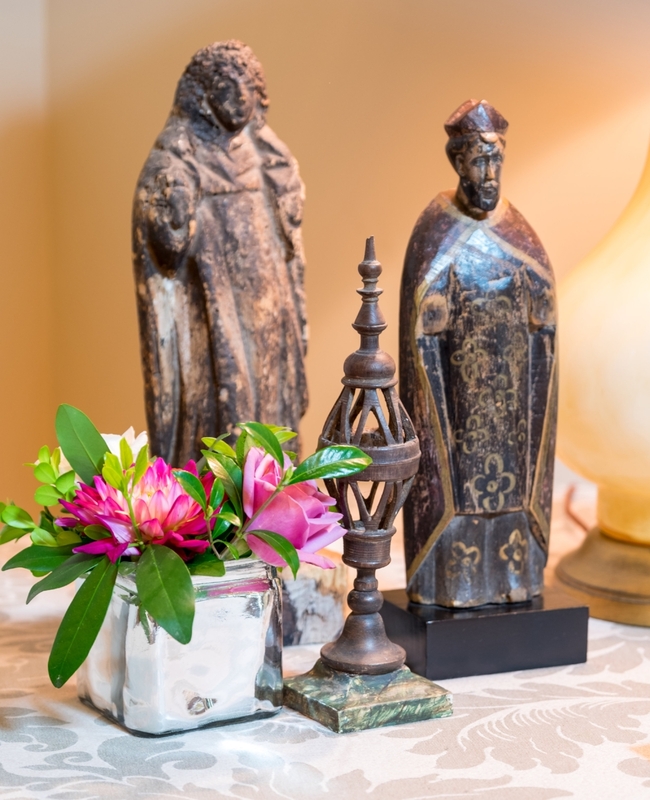 For years now, we have been decorating friends' houses for Christmas...adorning them with wintry floral arrangements and lots of fresh greenery. This year, in addition to decorating houses, we launched our first Christmas ECommerce Shop we termed, Bourbon & Boxwoods, and sold lovely hand-made wreaths filled with all of our favorite touches - pheasant feathers, kumquats, birds nests, and lots of sparkle! Why Bourbon & Boxwoods you might ask? We're glad you did. Because boxwood is our favorite type of greenery to use at Christmas and bourbon is our favorite drink to sip. Who doesn't love wiring in a pheasant feather into a fresh wreath whilst drinking a bourbon on the rocks on a cold December evening? Okay, maybe that's just us. Regardless, we hope you like some of our favorite creations from this Christmas. I got to do a fun (last minute) styled shoot a few weeks ago. Here is another sneak peak!